Described by James Hall in 1876 as "elongate-tubular, obconical or trumpet-shaped bodies, rapidly enlarging toward the aperture, which is campanulate with the margins always imperfect." 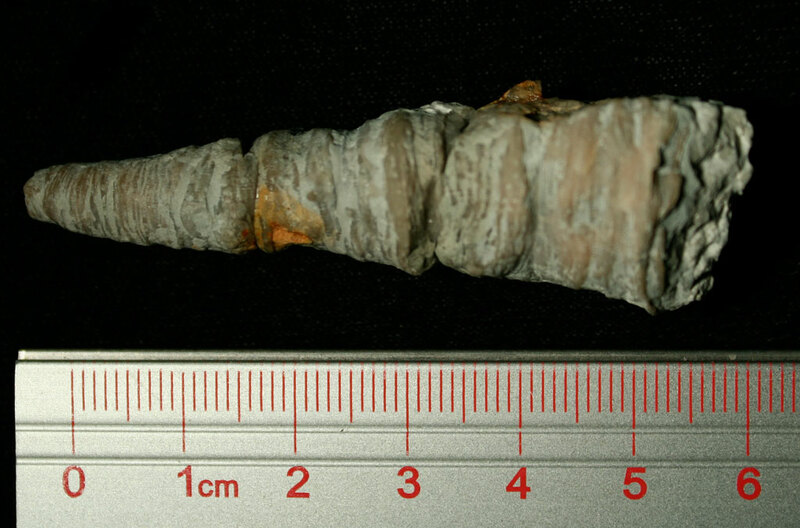 The Cornulites propius worm tube fossil is found in the Waldron Shale of Bartholomew County, Indiana. 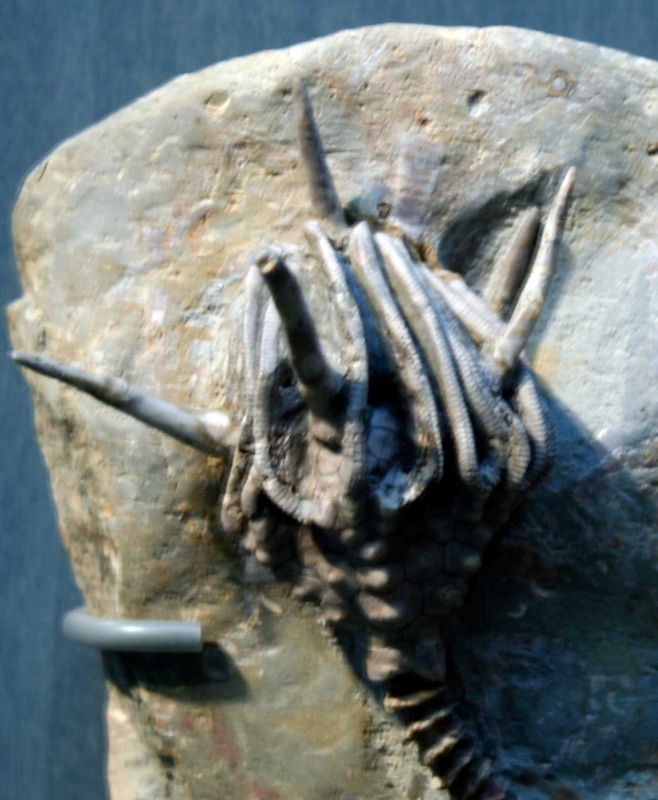 These creatures lived in the Silurian Period. 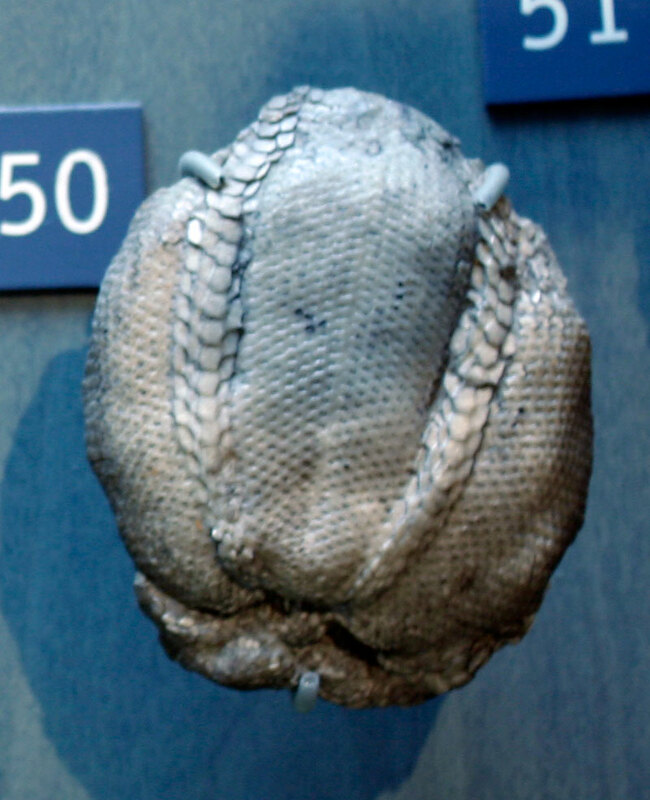 Trilobites made simple from Black Country Museums on Vimeo. The Calymene blumenbachii or as they call it "the Dudley Bug" is described in this video by Graham Worton, keeper of geology at Dudley Museum and Art Gallery. The museum is located in the Black Country, Midlands of the United Kingdom. 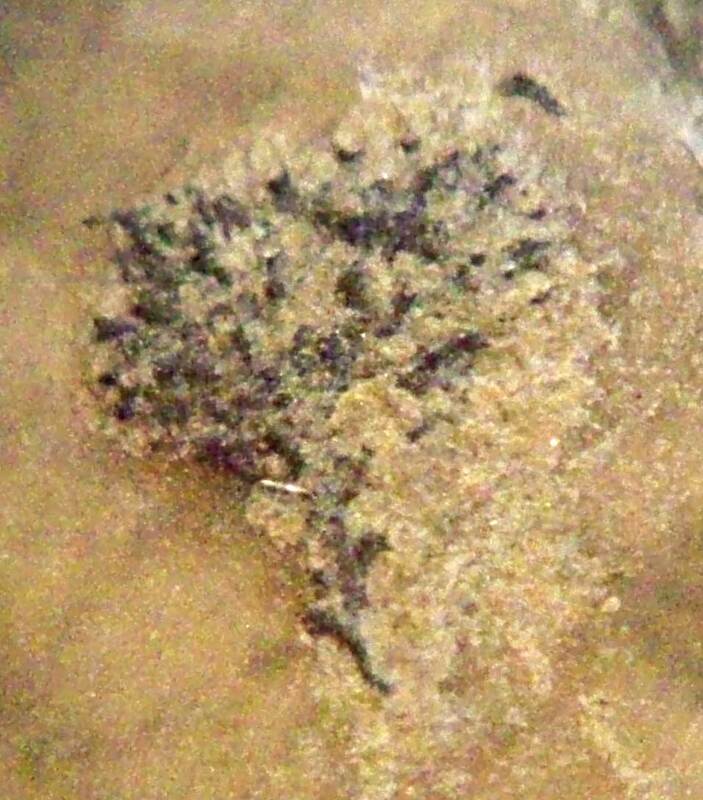 The Importance Of Microfossils from Black Country Museums on Vimeo. 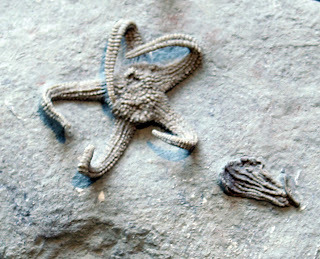 Another on the different types of fossils. 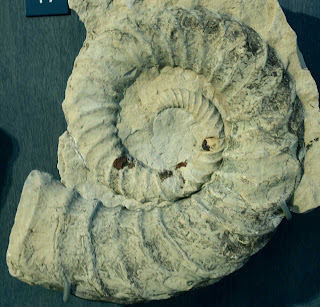 Some different types of fossils from Black Country Museums on Vimeo. What is a Fossil? from Black Country Museums on Vimeo. This is one of the best preserved bottom valves I have found of a Leptaena waldronensis brachiopod fossil. The fossil has been air abrasive cleaned. 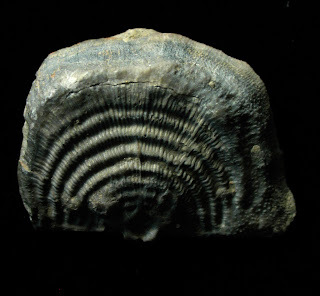 It was found in the Silurian Waldron Shale of Clark County, Indiana. Poloniproductus varians Biernat (1966) brachiopod fossil found in Holy Cross Mountains of Skaly, Poland. This fossil is from the Eifelian (Devonian) Period. 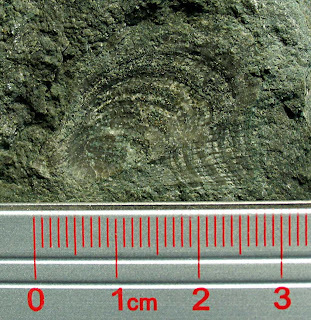 Learn more at this paper GENUS POLONIPRODUCTUS NOV. (BRACHIOPODA, DEVONIAN) by Gertruda Biernat and Stanislas S. Lazarev in Palaeontologica (1988) at this web link. This fossil is the remains of a floating crinoid called the Saccocoma pectinata. 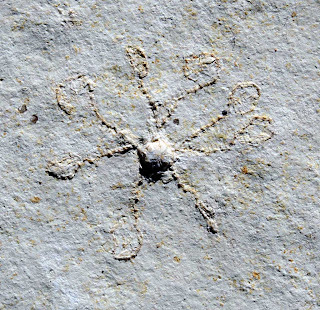 Found in the famous Solnhofen Limestone of Eichstätt, Bayern, Germany. Dated to the Jurassic Period. 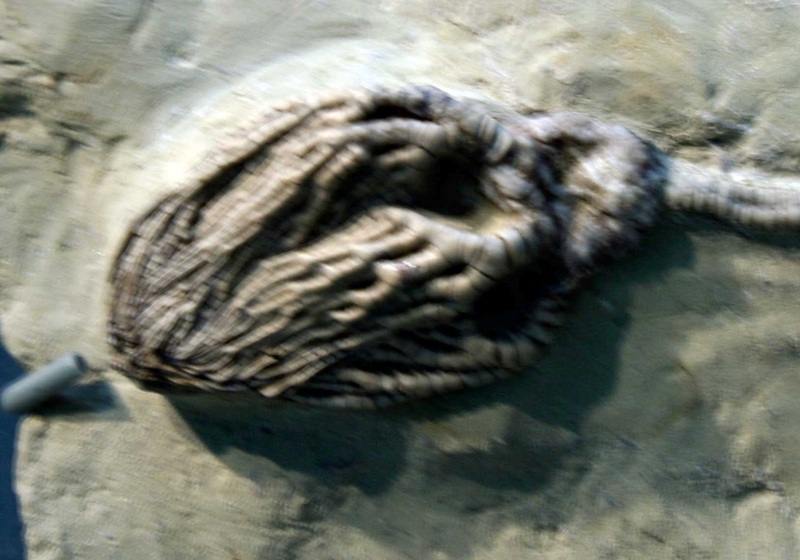 This amazing creature would have been a sight to see when it was alive floating in the Tethys Sea. 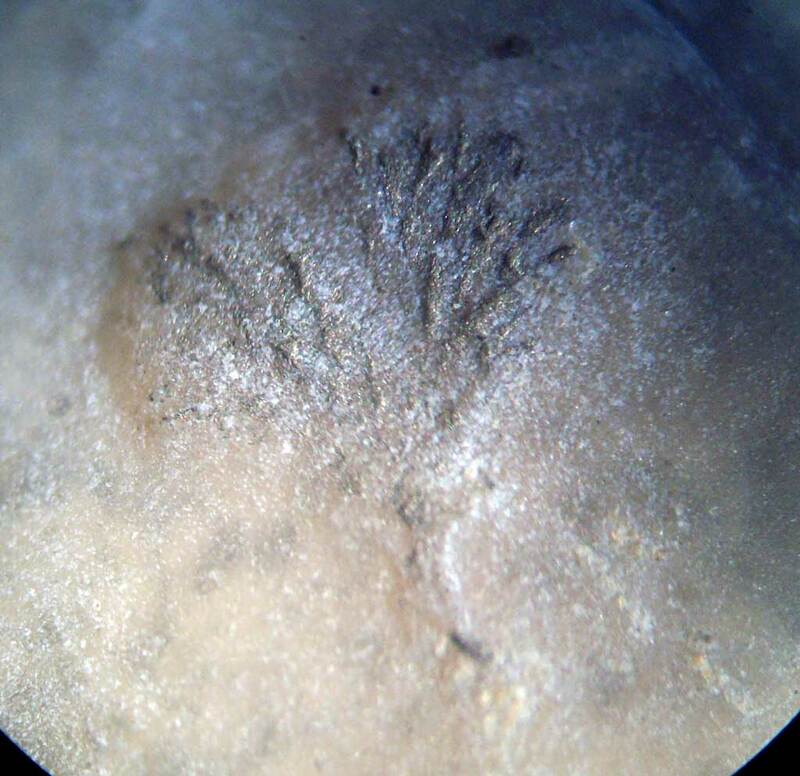 This fossil imprint was a nice find. It appears to be a Pterinea brisa Hall (or Ambonychia (Pterinea) striaecostata McChesney 1869) pelecypod fossil found in the Silurian Waldron Shale of Clark County, Indiana. 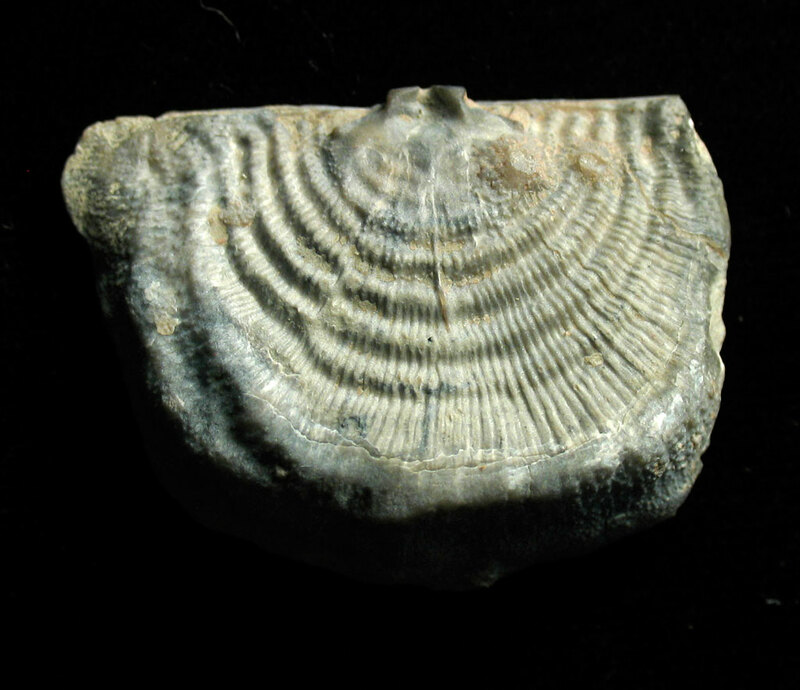 A similar bivalve is found in the Rochester Shale of New York called Cornellites emacerata Conrad. impression in right valve large and nearly round, near the middle of the length of' the shell. 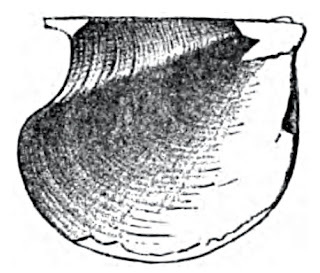 In the casts, beneath or just anterior to the beak, there is one short curving dental pit, with. smaller accessory one. This is a feature not observed in the Waldron specimens, which are usually found as the exteriors and often as. 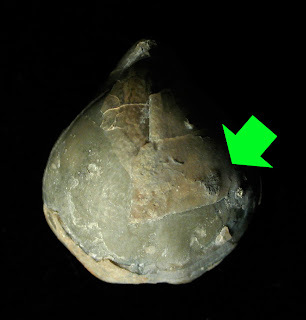 imperfect interiors of the valves; the few casts which have been observed from this locality, do not show the muscular marking. 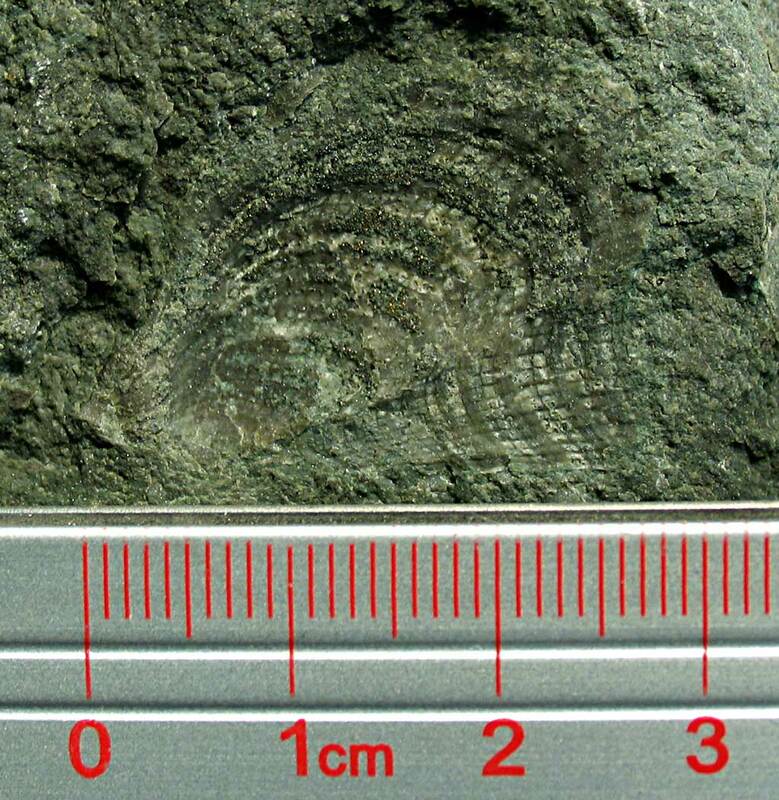 Surface marked by strong radiating and concentric striae, with broad, little elevated, radiating ribs. 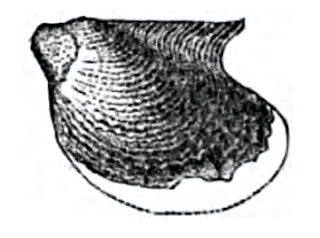 The concentric striae of growth are produced into prominent, recurving, fimoriated laminae, the fimbriae being infolded at their margins and bending backward in the form of long, hollow, semicylindrical spines, leaving a broad sinus between, in the bottom of which is a shorter spine. 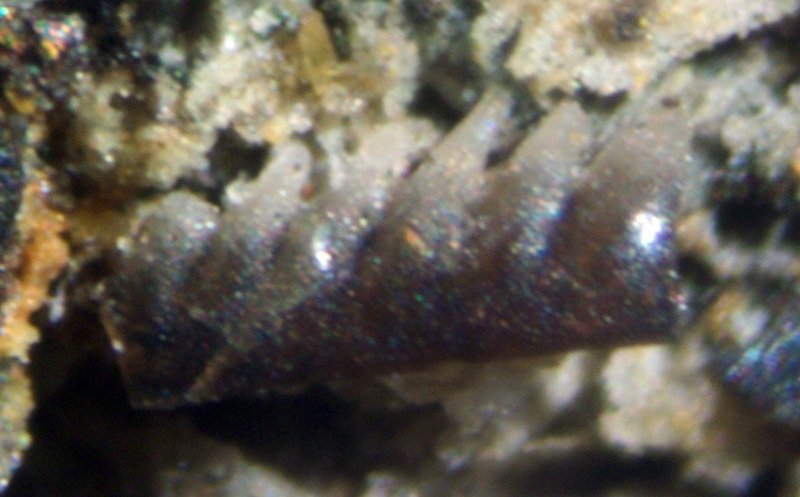 The younger specimens, as usually preserved, present simple fimbriated lamellae. 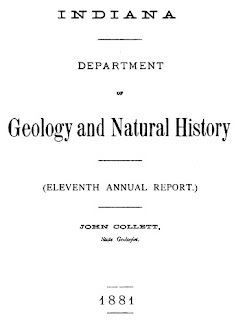 This post provides a link to the Indiana Department of Geology and Natural History 11th Annual Report of 1881 with John Collett State Geologist. It was published in 1882 at Indianapolis by Wm. B. Burford, State Printer. 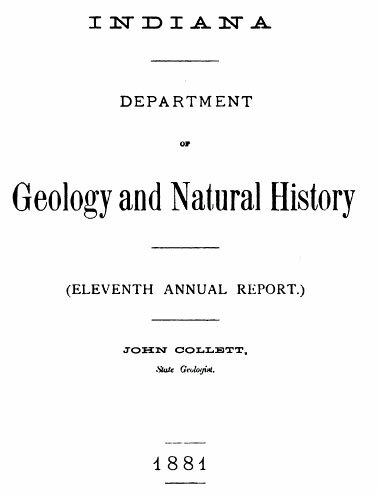 I am somewhat amazed they got the state legislature to pay for reports like this describing fossils and a shale layer that has no economic benefit to the state. Regardless, I am glad they did because it has been a big help to me. 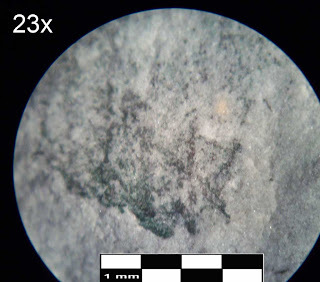 I refer to this report quite a bit on this blog because it has extensive plates of the Waldron Shale fossils found in Indiana. While this scan is not the best copy it is an essential set of information for those collecting and studying fossils from this area. One can find it at the Google Books site at this web link. Thanks Google Books for providing this great service! 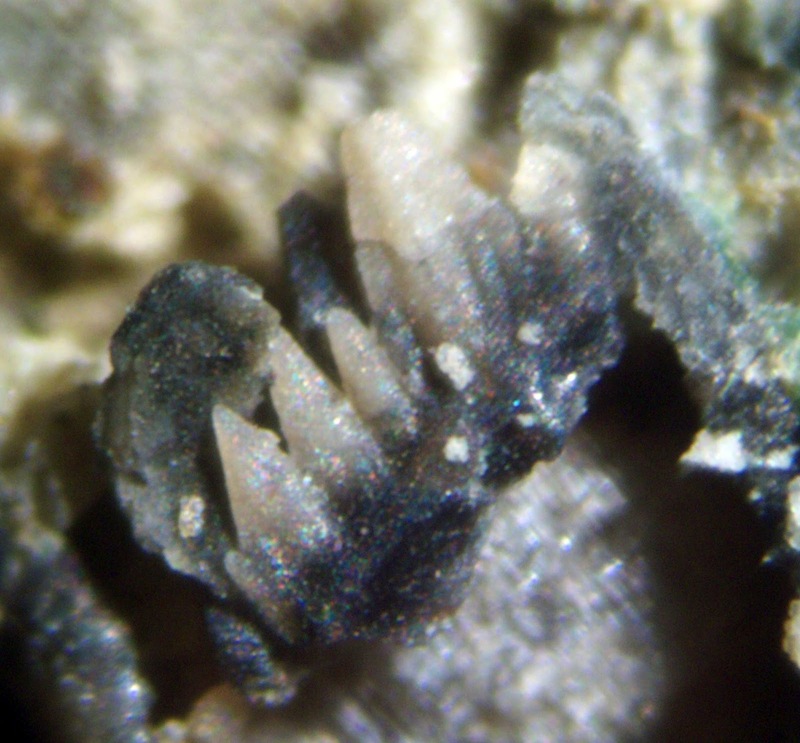 Picture of a bryozoan attached to Whitfieldella brachiopod from the Silurian Waldron Shale of Clark County, Indiana. Unfortunately, part of the byrozoan fossil was destroyed when I tried to clear some the matrix encrusting it with a sand abrasive cleaner. My artificial sand storm swept across this 400 million year old fossil and disintegrated the surface features of the fossil colony in an instant. Despite my efforts of trying to pulse clean this very small area, the flow rate was too high. Hopefully, I will find another colony and be much more careful on how it is cleaned. See next picture. 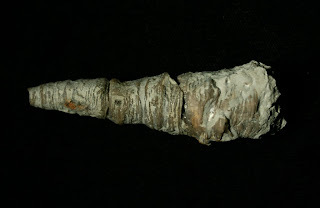 Exactly what this fossil was called had been bouncing around in my mind for a couple weeks.While paging through The Fossil Book, I came across a picture of the Devonian Flabellotrypa rugulosa found in Tennessee. 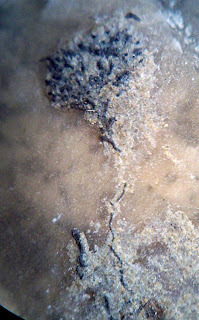 Some information about the Flabellotrypa can be found in R. Bassler's paper on bryozoan. R.S. 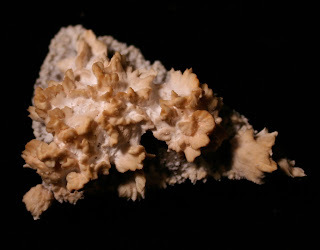 Bassler describes a bryozoan Flabellotrypa as, "Like Sagenella, but zooecia open only along outer edge of the incrusting flabelliform zoarium. More or less circular attached disks about 3.5 mm wide, of parallel, contiguous, transversely striated tubes. 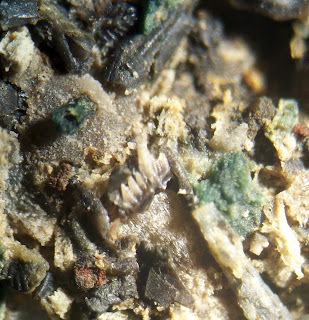 Type species: F. rugulosa"
Bryozoum a thin membraniform expansion growing upon the surface of other organic bodies. 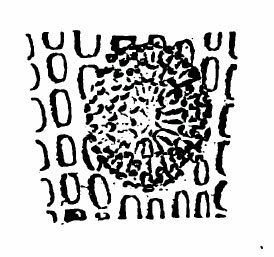 Cells subcylindrical, flattened for the greater portion of their length and continuing nearly parallel with the plane of the epitheca; arranged in a more or less diverging or radiating order, with intercalated ranges, presenting a subimbricated aspect, turning abruptly and opening upward. Cell-apertures circular, about two millimeters in diameter. 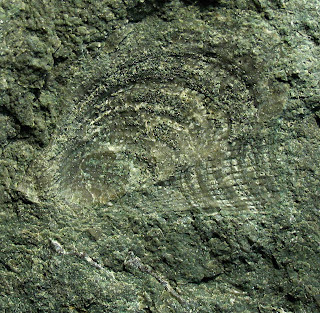 The arrangement of cells and form of cell-apertures differ from CERAMOPORA in the rounded form and more directly upward opening. The genus differs from LICHENALIA in the more extended procumbent portion of the cell-tube, in the form of the cell-aperture, and in the much thinner and persistently adhering epitheca. Bryozoum growing in circular or subcircular discoid forms upon other organic bodies; greatest diameter observed about seven millimeters. 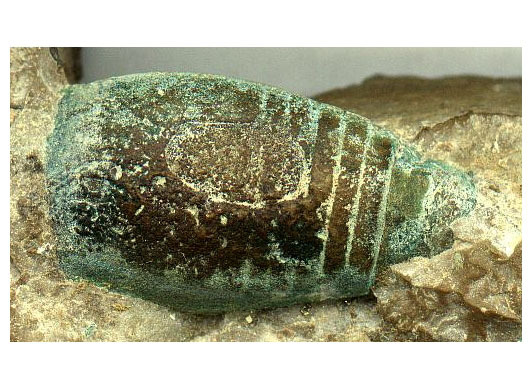 Cell-tubes short, cylindrical, radiating from the center and increasing by lateral additions, those in the central portion being nearly vertical, and becoming more and more oblique as they recede from this point, until the marginal ones are nearly parallel with the epitheca; arranged in alternating and imbricating series. Apertures arched or somewhat triangular, .25 mm., or less, in diameter. 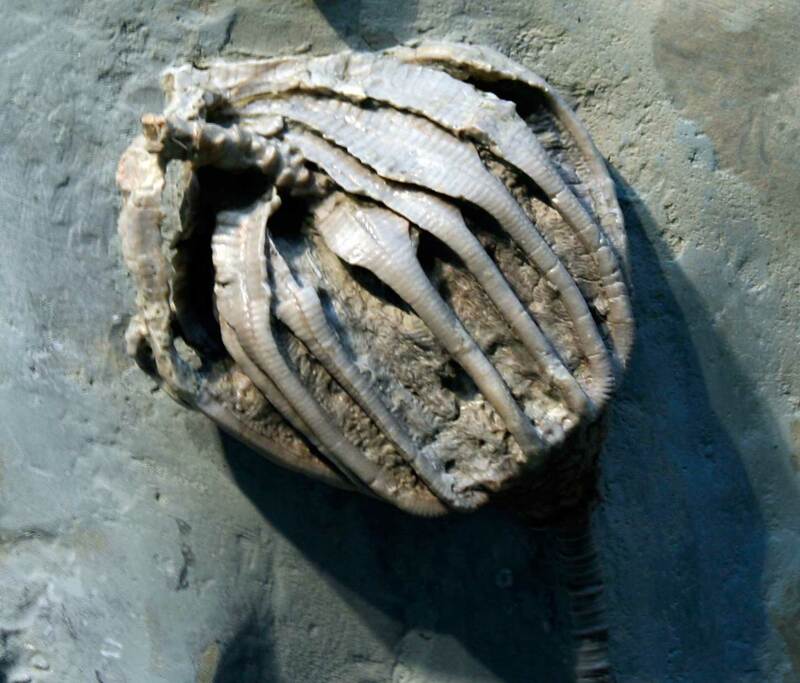 This species is found attached to the bases of crinoids, to gasteropods, and other fossils. These last pictures show the fossil specimen first where it has been cleaned and second before it was cleaned. 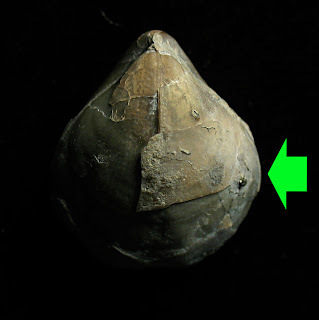 It is interesting as one can see the bryozoum started at one point on the brachiopod and began growing in wavy line across the shell. Eventually one reached an ideal spot in the feeding current and multiplied out into a subcircular form. Scales should have been included on the pictures but I did not photograph them. 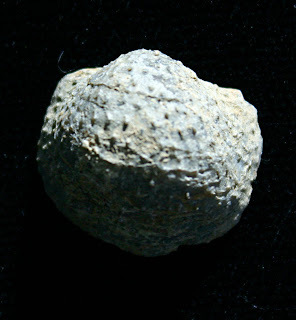 Brachiopod is about 2 cm wide and 2.2 cm long. The bryozoan is about 1 mm wide. 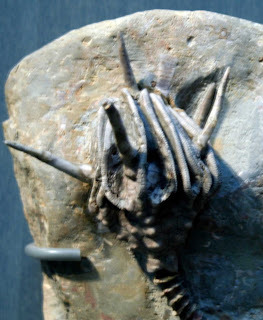 Abatocrinus grandis crinoid lived on the seafloor in the Mississippian Period. 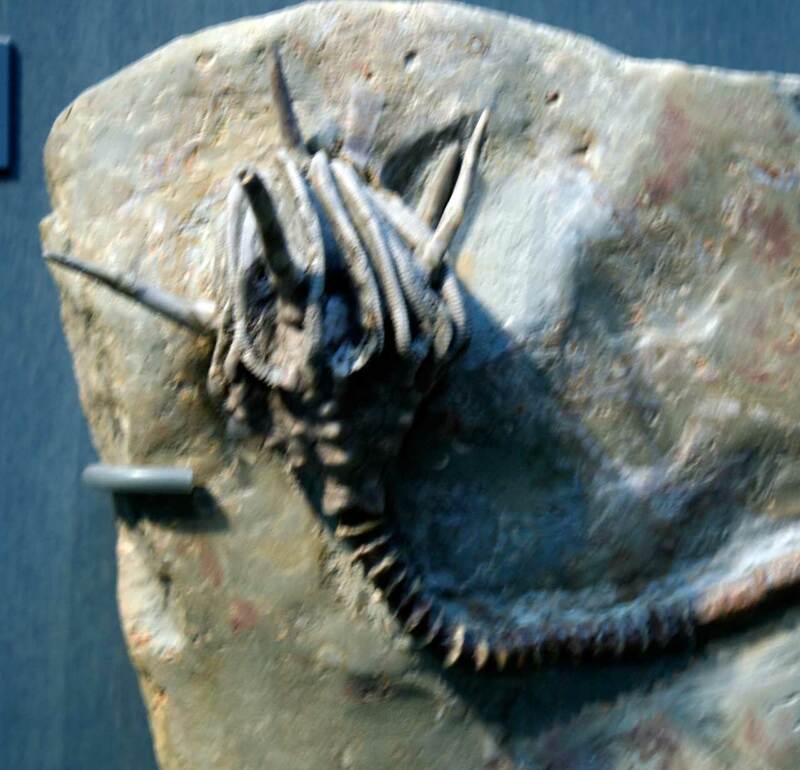 This fossil is on display on the first floor of the Indiana State Museum as of May 2012. 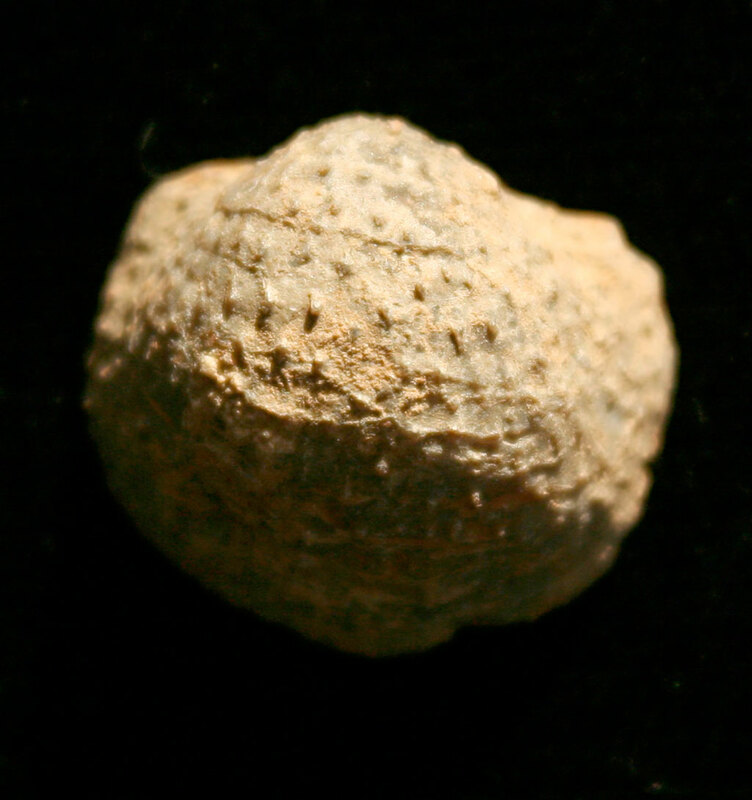 This fossil is from Crawfordsville, Indiana. That is a some beautiful 3-D prep work! 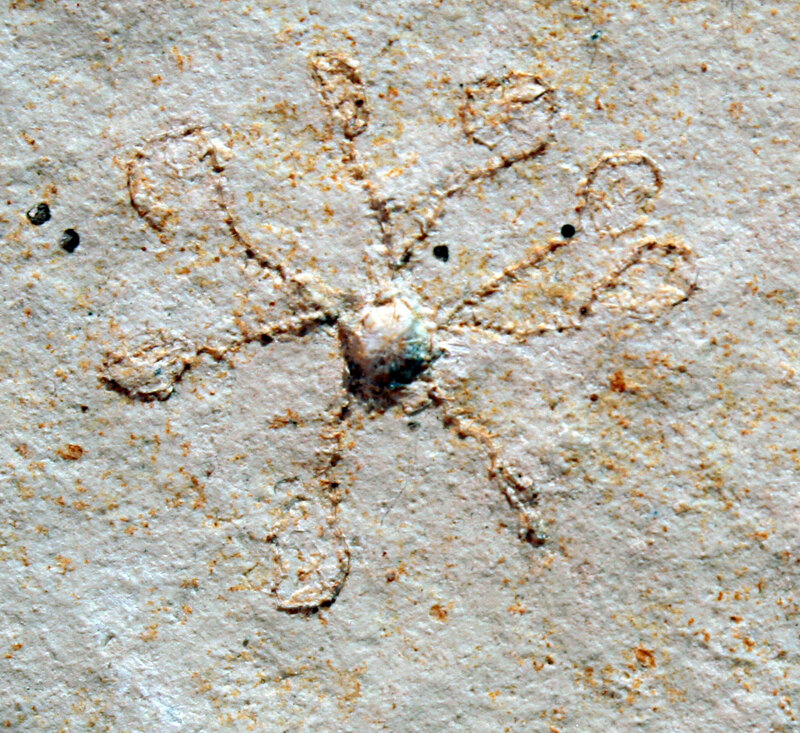 Cyathocrinites multbrachiatus crinoid lived on the seafloor in the Mississippian Period. This fossil is on display on the first floor of the Indiana State Museum as of May 2012. 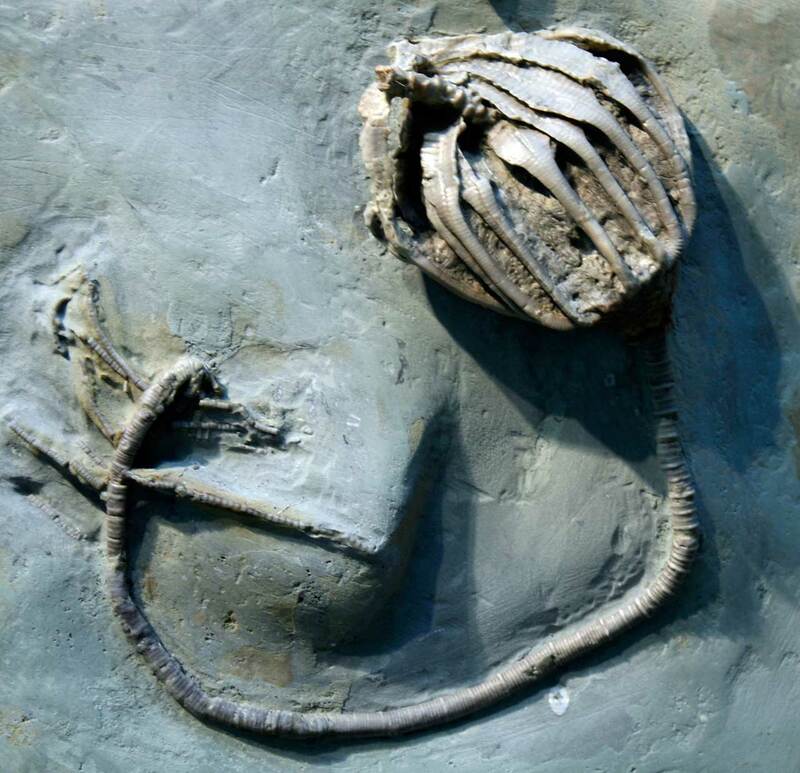 More than likely this fossil is from Crawfordsville, Indiana. That is a some beautiful 3-D prep work! 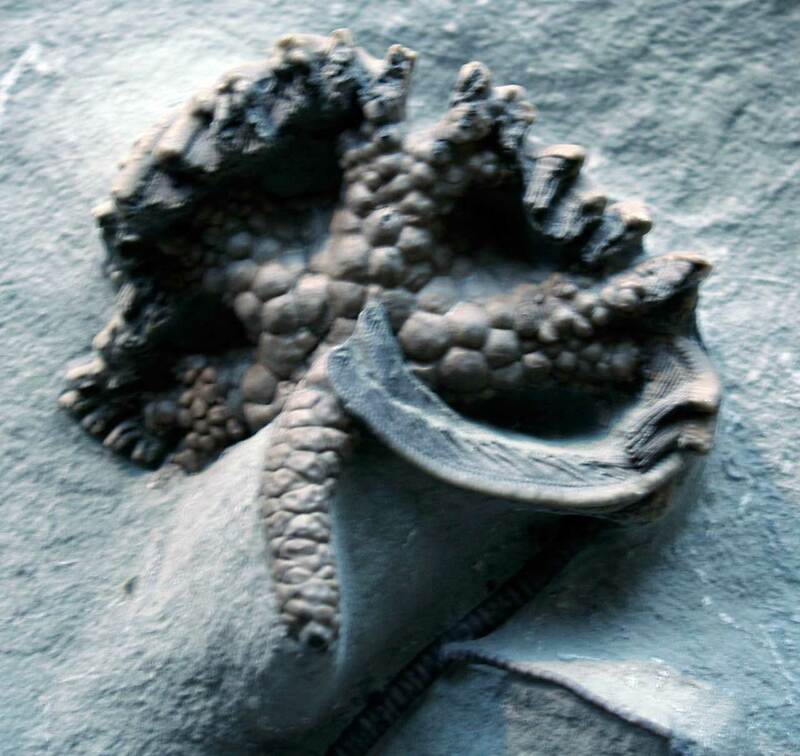 This Eretmocrinus granuliferus crinoid lived on the seafloor in the Mississippian Period. 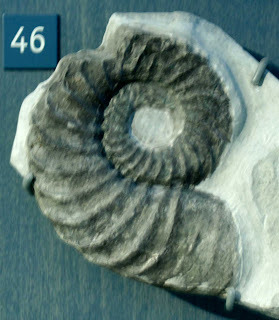 This fossil is on display on the first floor of the Indiana State Museum as of May 2012. 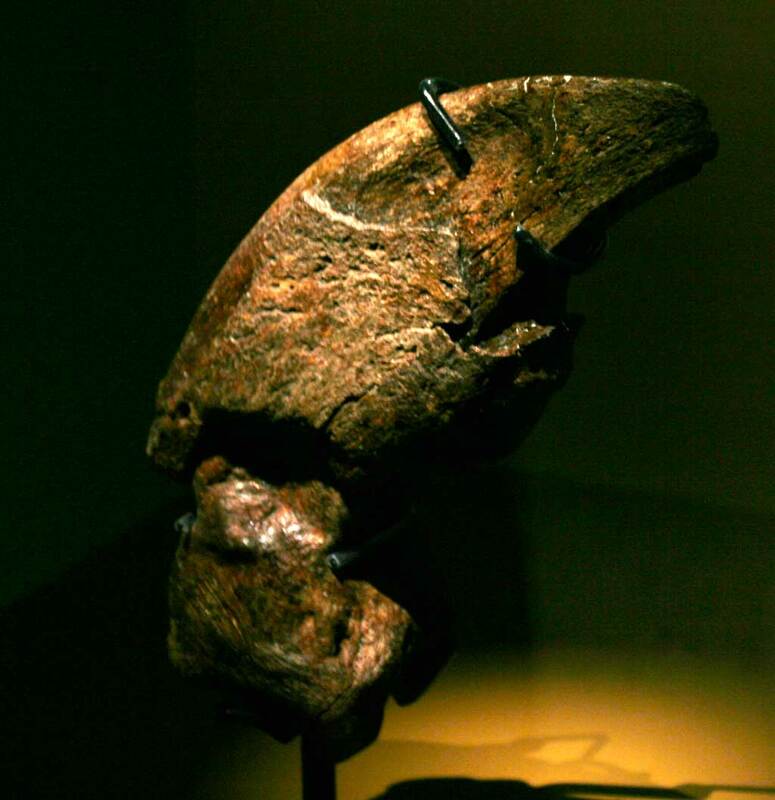 More than likely this fossil is from Crawfordsville, Indiana. That is a some beautiful 3-D prep work! 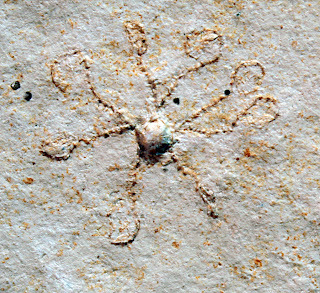 Onychaster sp. starfish fossil that crawled the seafloor in the Mississippian Period. This fossil is on display on the first floor of the Indiana State Museum as of May 2012. More than likely this fossil is from Crawfordsville, Indiana. That is a some beautiful 3-D prep work! A while back I was working with some North Evans Limestone samples looking for conodont fossils. Dave at Views of the Mahantango blog had left me with some specimens to work with. He told me to dissolve the pieces in vinegar and then look for small fossils. This worked (see pictures at bottom of post) and afterwards I left the samples in the sun room where I do most of my photography and microscope work. 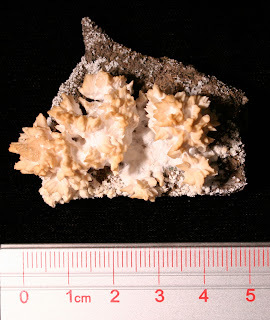 Several weeks passed when I noticed something interesting in the container, formations of white crystals were forming. As it turns out a chemical reaction was taking place, one in which the limestone samples (calcium carbonate) were interacting with the vinegar (acetic acid) to form water, carbon dioxide, and calcium acetate (calcium salt). 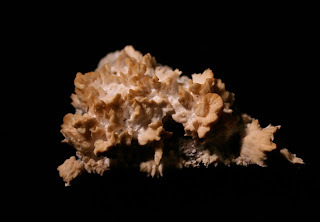 The carbon dioxide floated off into the atmosphere, the water eventually evaporated, which just left the limestone and crystallized calcium acetate. 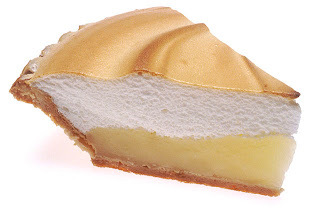 The calcium acetate formed a texture and color that reminded me of the layer of meringue that one finds on lemon pies. The last three pictures are of some Devonian Period conodont fossils I found in the limestone. Not sure of their names but if I had to guess maybe a Prioniodus sp. 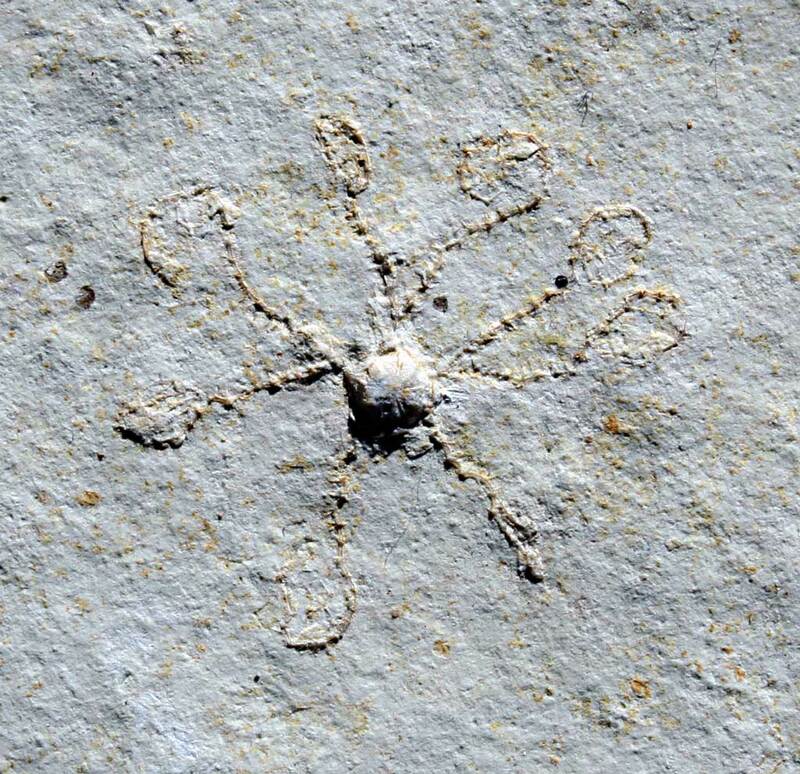 Learn more at the web site of North Evans Limestone fossils found at Penn-Dixie Cement Quarry in Hamburg, New York. Silurian Green Fossil - Bickmorites? Sometimes when one is searching for fossils in the field, color is important as opposed to just trying to visually match shapes and patterns. In the case of today's posting, the color green is important. 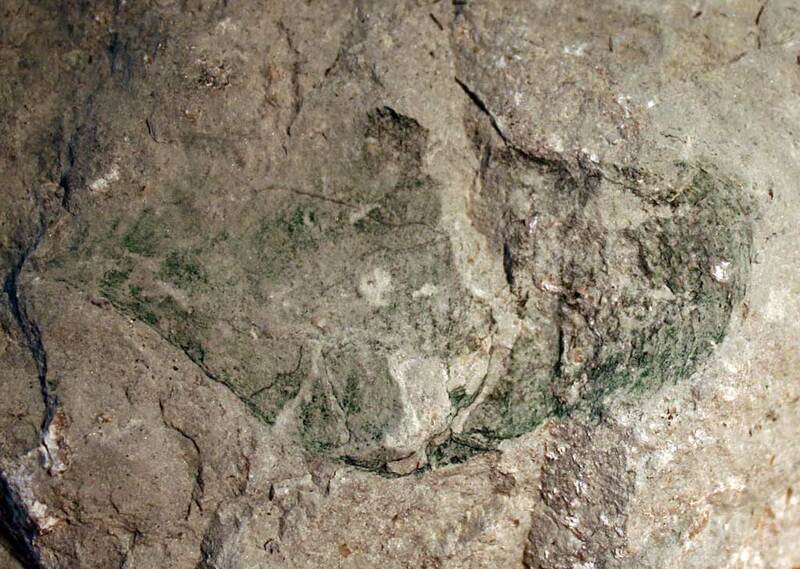 The Silurian Period Louisville Limestone found in Jefferson County, Kentucky at times has green blotches that show through. I assume this is a sign of some sort of copper being present. 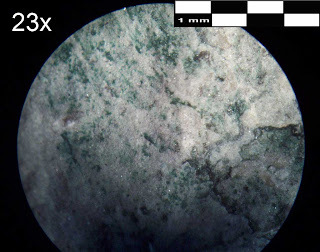 (UPDATE: see comment section as the green material might be glauconite.) 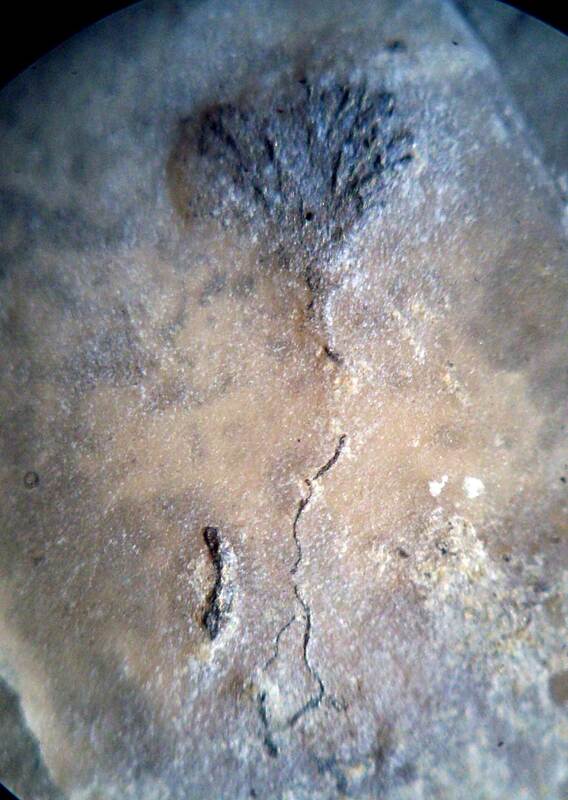 My cousin told me this could be a sign of a cephalopod fossil which tend to be difficult to find in this rock layer. 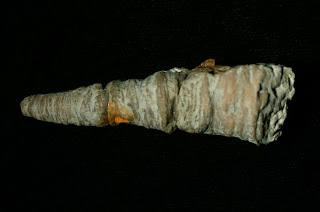 Mostly one finds corals (chain or colonial types) and some brachiopods with rare trilobite or graptolite fragments. 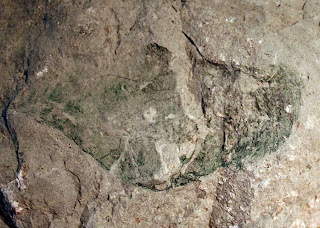 Years ago, I saw cephalopod fossils found by others but recently I came across the remains shown in these first three pictures. After visiting the Indiana State Museum and seeing some of their Silurian cephalopod specimens, a green color was present in some of those specimens. Their material was from the Wabash Formation if I remember correctly. This formation might not quite match up with the Louisville Limestone. These next two Bickmorites sp. 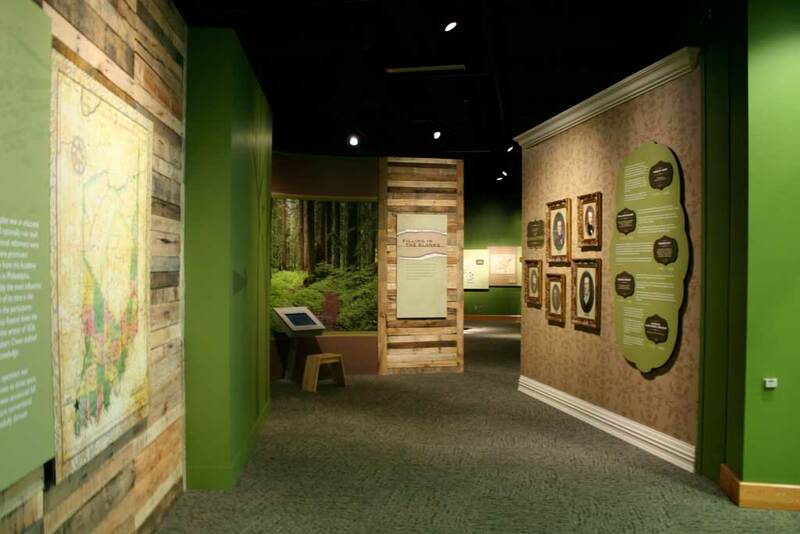 specimens can be found on the first floor of the Indiana State Museum as of May 2012. 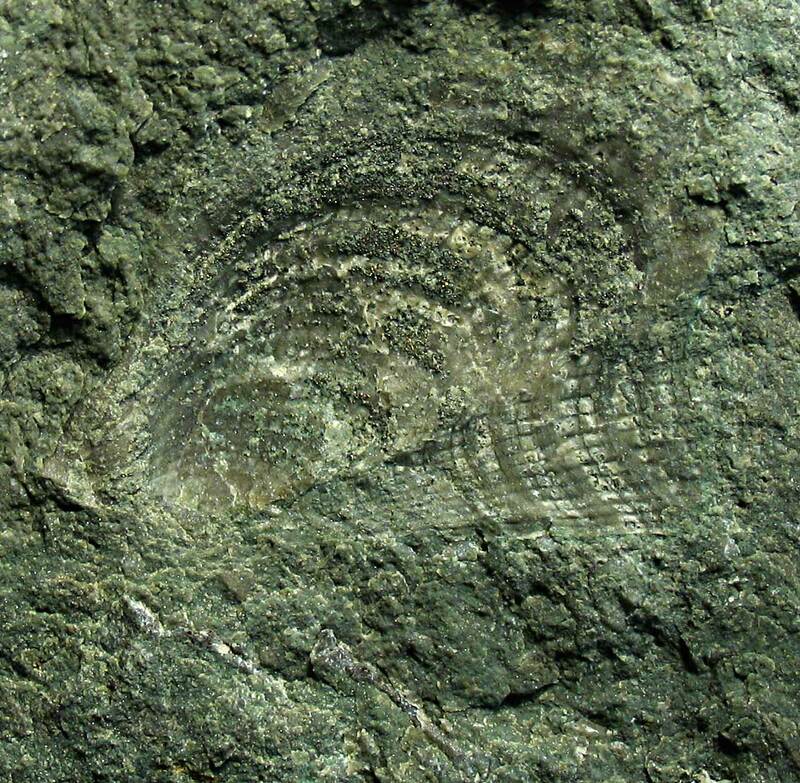 They are in the fossil area in the Silurian case. 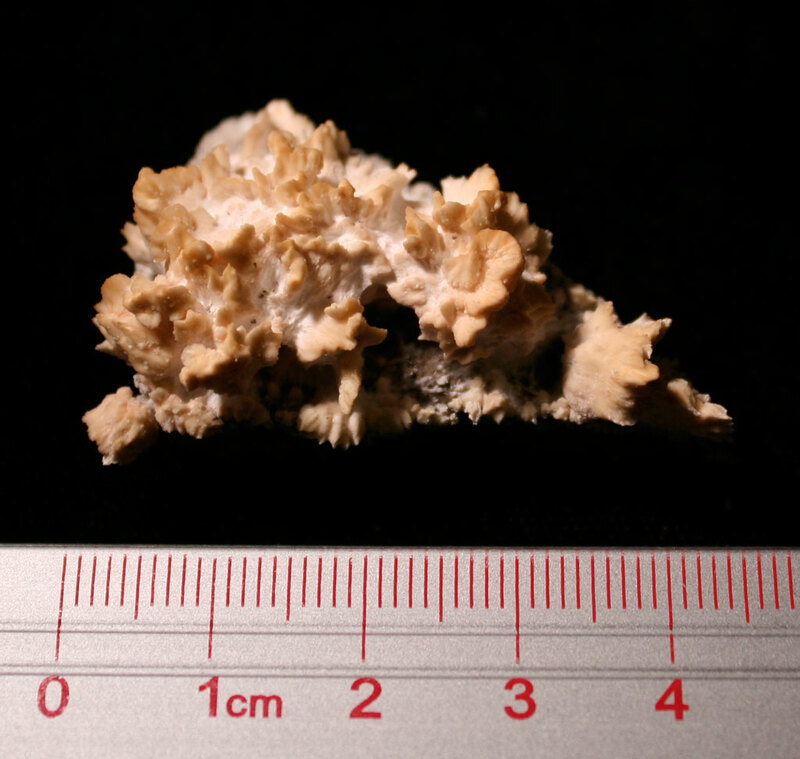 See a Bickmorites sp. specimen at the Indiana State Museum on-line database. Last two images are magnified areas of the green fossil I found in the Louisville Limestone. Learn more about these creatures at this web site. A reader of this blog, avid fossil collector, and chemist Jack Kesling of Pennsylvania sent me a nice fossil find that relates to this posting. 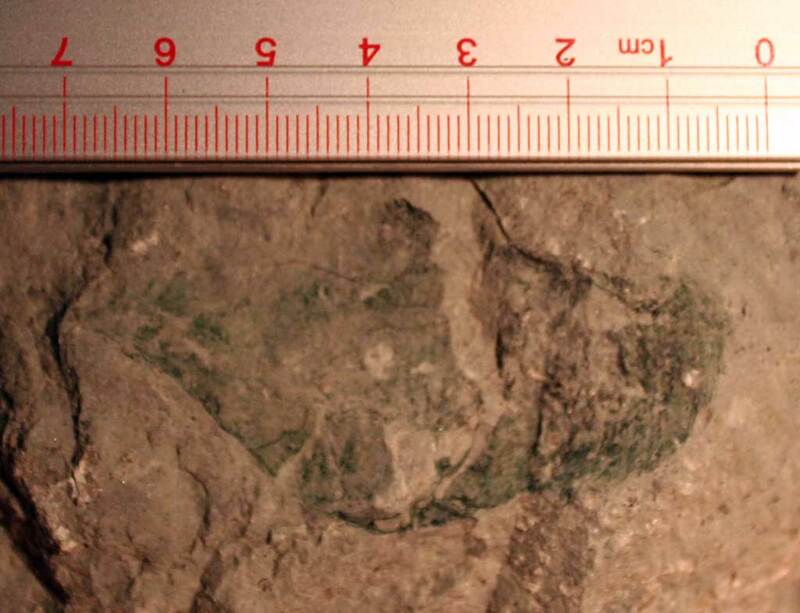 He found this unidentified Silurian cephalopod fossil with a lot of greenish material on it. 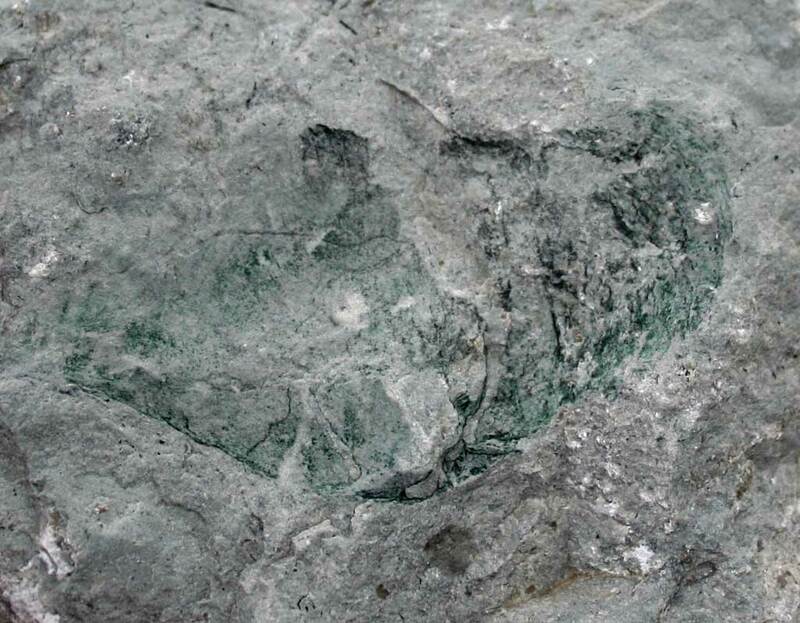 The fossil was found in the Bertie Formation of Herkimer County, New York. 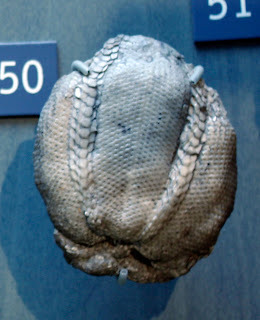 This large Silurian fossil is of a Carcinosoma newlini eurypterid. Fossil was found in the Kokomo Limestone of Indiana and is housed at the Indiana State Museum (Indianapolis). 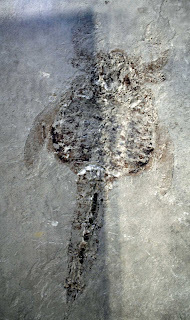 Creature swam the seas that covered the state in the Late Silurian Period. 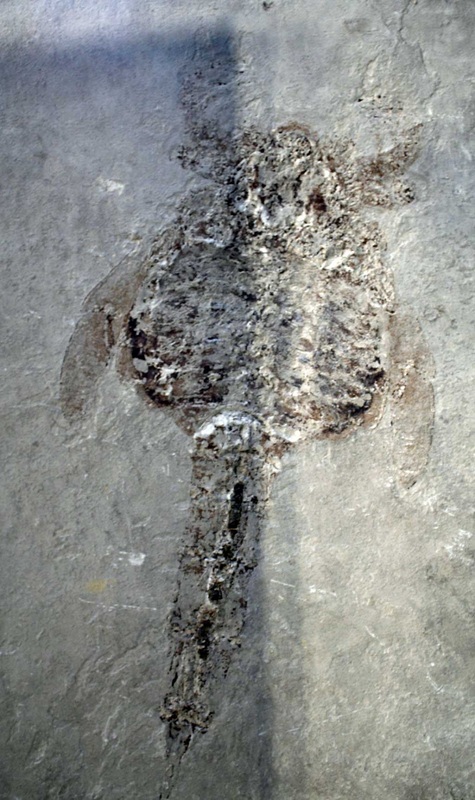 Note: there is a shadow across the fossil causing one side to be darker than the other. Learn more about this type creature on Wikipedia.